Big Fat Piggy Bank: DiGiorno Supreme Pizza Deal at Wags! DiGiorno Supreme Pizza Deal at Wags! 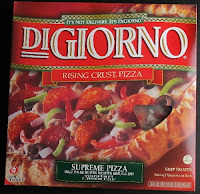 Boy was I surprised when I saw that the DiGiorno Supreme Pizza's were ringing up 2/$6 at my Wags instead of 2/$10! This makes the Kraft Register Reward Deal from HERE even better! Just confirm that they are ringing up 2/$6 at your store too. $11 for 4 Pizzas and 2 Cans of Nuts or $1.83 an item! Get Back $5 RR = $11.78 for 4 Pizzas, 2 Cans of Nuts & 2 Diet Cokes! less 4 Free Cakesters B1G1 = 10 OOP and get 5 RR = .62 ea...but that is a lot of cookies!